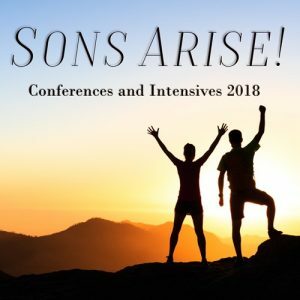 Sons Arise! 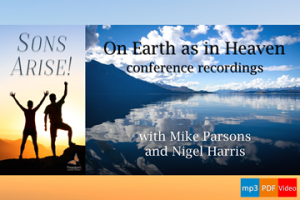 was a series of unique conferences and intensives with Mike Parsons, held at the Freedom Centre, Barnstaple, UK. Recordings of these events are now available. for more information and/or to order the recordings. Note: although we are not planning any further Sons Arise! 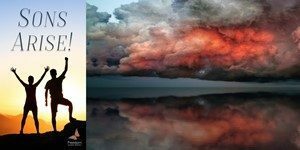 events for 2019, what we do plan is a larger gathering entitled ‘The Restoration of All Things‘ with Nancy Coen, Justin Paul Abraham, Lindy Strong and Mike Parsons. Click here for details and to purchase tickets. This event is now concluded. Includes downloadable video, audio and PDF files. Includes downloadable audio mp3 and PDF slides only. working through this material in addition to simply listening to it. Tuesday 24th July @ 09:30 BST (GMT+1) – Thursday 26th July 2018 @ 22:00 BST (GMT+1. Topics likely to include: Deeper fire stones activations – Engaging the chancellors’ houses of the circle of the deep – Dual realms lifestyle – Receiving your mandates – Framing time and space. Includes downloadable audio mp3, video mp4 and PDF slides. Recordings are available now in audio, video and PDF format. Topics for this intensive include Rewiring, Abilities and Consciousness, Deconstruction of our Image of God and the Bible, Communion, Framing Time and Space, Engaging Spiritual Realms and a Meditation for Rest process led by Mike and featuring music from SML Music. These are not your typical Christian conference at all! 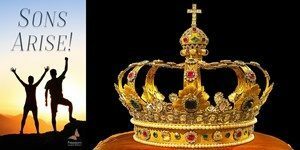 At these events we engaged heaven together, seeking to receive all God has for us – revelation, transformation and empowering – and to step into the fullness of our identity, inheritance and authority as sons of the King so that we can fulfil our eternal destiny. 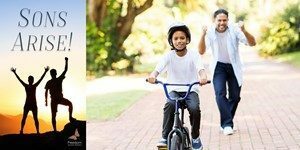 There were teaching and activations relating to the topics listed below, and plenty of opportunity to meet and dialogue with others on this journey, including Mike and other members of Freedom Church locally as well as other conference delegates. In addition to the 3 conferences we also hosted 3 events we called ‘intensives’ – these workshop-style events were limited to around 25 participants and are teaching-intensive but very much encounter-intensive. Recordings of all these events are now available (see above). 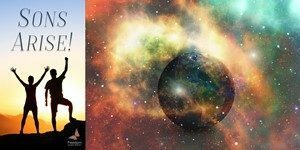 The composite image of the earth and space is composed of two images from Pixabay: globe by qimono and universe by geralt, both used under Creative Commons CC0. Event organiser: Freedom Apostolic Ministries Ltd., a not-for-profit company registered in England. Company number 10359676. Registered office: Freedom Centre, 1 Howard Avenue, Barnstaple EX32 8QA, UK.